The Queens 10k is the shortest of the five borough races. With the sound of the horn, we headed north around the fountain of the planets and turned east to run alongside the Van Wyck Expressway for our first two miles. Although the race started cool, it quickly warmed up and it was good to see the additional water stations and misting stations that were hoses spraying over parts of the course. We looped back around Meadow Lake to head back west towards the way we started. After the 5k mark, we crossed over the Long Island Expressway, we began to see the Queens landmarks, as we passed the theater in the park and the Queens Museum. After the mile 4 marker, it was an out and back to outside of Citifield – home of the New York Mets – and a return past the Arthur Ashe Tennis Stadium. 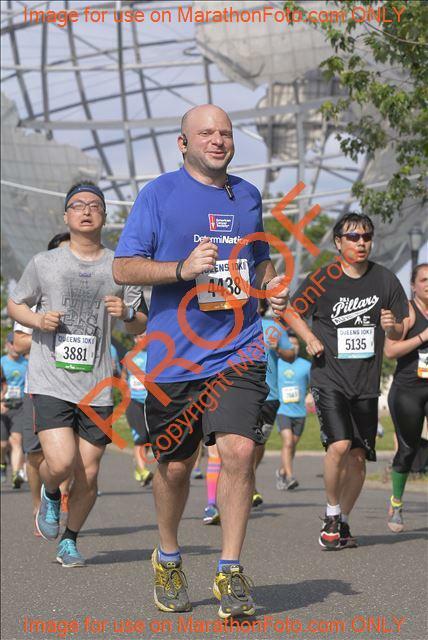 Just like in previous years, running towards the iconic Unisphere globe was an inspirational moment that carried me to the mile 6 marker and the finish line beyond. After a hot 57:16, and an average pace of 9:14, I was able to beat my previous Queens 10K time by three and a half minutes. Passing the finish line was a good feeling and was a good first race for my marathon training season, as I look forward to running more races in the coming months as I prepare for my marathons this fall.